I can be fussy about my projects at times. I’m a chronic over-thinker – to the point I will procrastinate on fun stuff I am wanting to do because I’m overthinking it or worrying I’m not going to be able to pull it off the way I have it in my head. More than one WIP languishes in boxes or bags because I’ve hit a snag & I’ve put it away to sort it out another time, when I can work out a fix for whatever is bugging me. My current project I feel at a bit of a stand still. 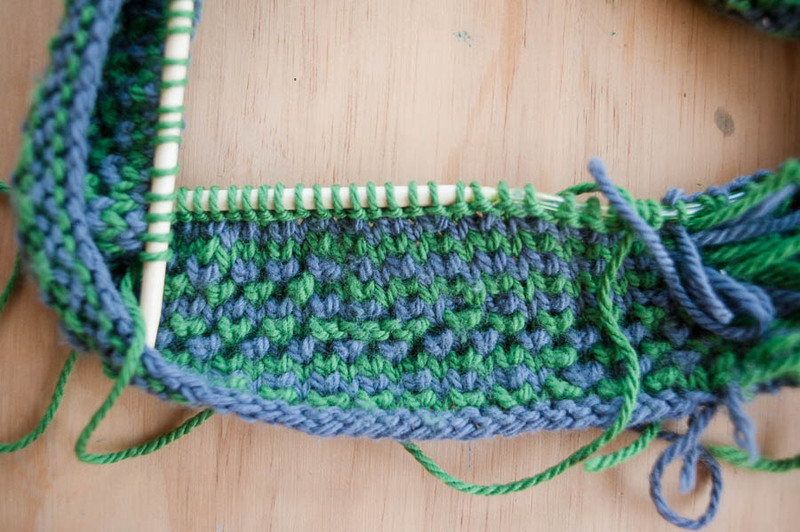 I am knitting myself a cowl. It’s cute. I love the pattern (found on Craftsy*). I love the colours. I have gotten the hang of knit-one-below after a few YouTube videos and a second attempt at the start. 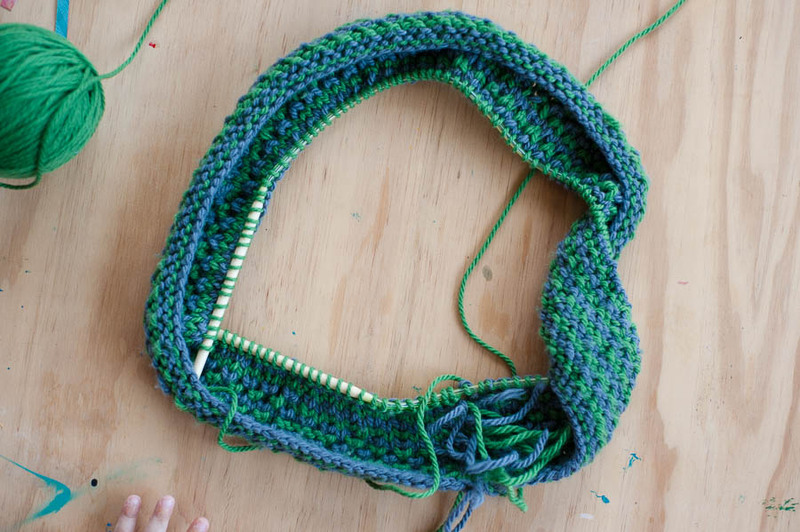 I’m almost half way through, and I’m thinking of frogging it. I first questioned it, around row four. After fastidiously checking and checking and checking before I joined in the round, and checking every row since for twists, some how, one magically appeared as I neared the end of my fourth round. But I let myself get talked into keeping it, because it’s a long cowl, and the way I would wear it the twist wouldn’t be noticeable. But. It’s becoming more pronounced (and yes, I had a little helper in the studio while I was photographing!). I kept pushing on. It’s pleasant, sitting of an evening, with all the small people in bed, chatting to the mister, and knitting away. Something as small as a twist, in something that would be worn twisted anyway, isn’t a big drama. Right? A row or two later, it became more obvious that I’d miscounted somewhere, and in sections, my “v”s were lining up instead of alternating. (and then when I took the photos for this post, I noticed a little part where I’d flicked in some purling instead of knitting). Can you see on the bottom left & top right, where the pattern is stacking vertically, instead of alternating & filling the gaps like in the top right? Then on Sunday night I came across a couple of dropped stitches. One I tried to rectify, but the k1b stitches made it tricky to hook the dropped loops correctly into place. Help me out, lovely readers, what would you do? Find redemption amidst the imperfections? Or cut your losses & start again? I’m a mistake-embracer, I’d go nuts if I had to make everything perfect, and even when I aim for perfection I stuff it up! I say keep going. honestly, I’d keep on keeping on and put it down to a learning experience. But then I tend to have lots of ‘learning experiences’. Is anyone likely to notice the mistakes when it’s being worn? If knowing about the mistakes going to stop you from wearing it? I made a big stuff up in a bag a few years back, but I still used it and got loads of compliments on it. When I pointed out the mistake everyone said they didn’t notice. So I stopped pointing out the mistakes. I’m not entirely sure, Amy. I /think/ the mistakes won’t be noticed, which is why I’m thinking just keep going and then I can frog at the end. 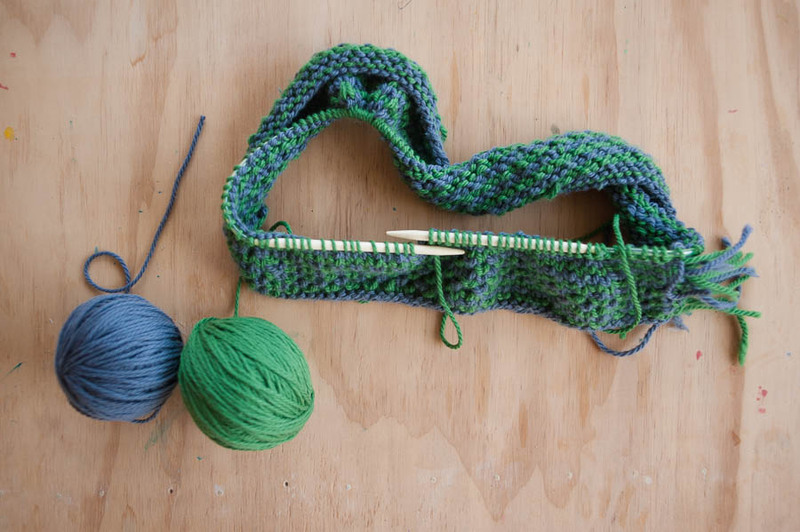 If it were a dress and the mistake was noticeable I would say frog back to the twist, BUT since this is being worn around your neck then I would keep going – call it a learning experience and that the way you aren’t wasting wool. That sounds like a good compromise!